Sotheby's New York will preside over the first Tri-State Heirloom Vegetable Auction. BOUNTY: You wouldn’t want to miss the first-ever Tri-State Heirloom Vegetable Auction, presided over by Sotheby’s New York. 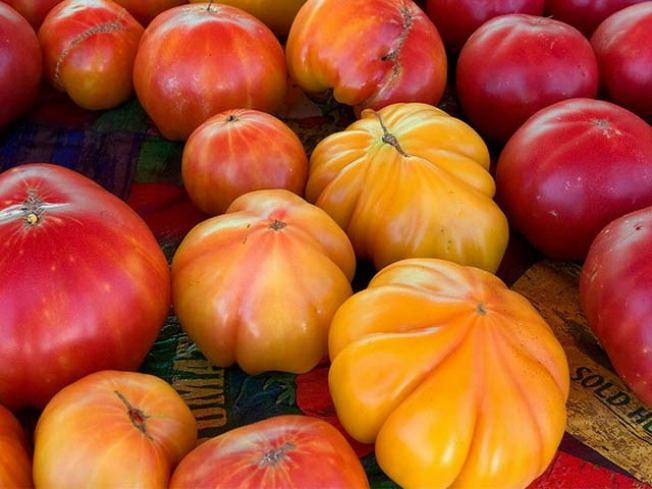 On the block: Veg from more than 40 local farmers, plus a passel of food experiences: celebrity chef dinners, NY wine country weekends, farm-to-table dinners and much more. It's all part of The Art of Farming, whose support list is massive, with everyone from Eric Ripert to Martha Stewart to Bette Midler on the roster. The event kicks off the 2010 NYC Eat Drink Local week; all proceeds benefit the immigrant-farmer supporter GrowNYC New Farmers Development Project and the Sylvia Center, which teaches kids to eat well. 7PM. CIRCUITRY: In the world of Spike Jonze’s crushingly poignant 30-minute short I’m Here, robots have evolved to such a point that they’re able to fall in love. The Where the Wild ThingsAre director will be on hand at the IFC Center to screen his “robot romance”—an overwhelming Sundance favorite--followed by a Q&A and book signing. (P.S. : I’m Here also screens regularly at imheremovie.com.) 7PM. TAPESTRY: Kicking off the BAM2010 Next Wave Festival with the NY premiere of her latest work Delusion, multimedia art-sprite Laurie Anderson weaves together short plays on the themes of identity and memory with a dizzyingly rich soundtrack (this time tapping Arabic strings and Tibetan temple horns). 7:30PM through 9/25; additional dates at BAM.org.